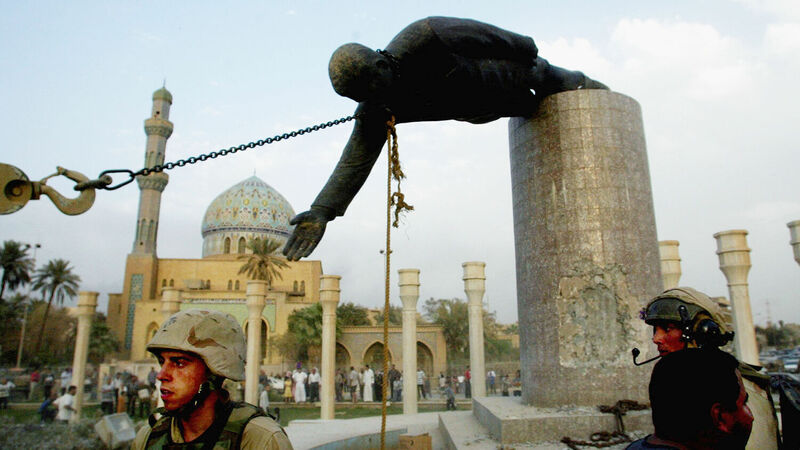 U.S. troops topple statue if Saddam Hussein on April 9, 2003, in Baghdad, Iraq. On January 17, the United States Army released its much-anticipated study of the Iraq War. First commissioned in 2013, this 1,300-page study thoroughly examines the events of the war, striving to take lessons from the conflict that can be applied to future conflicts. In the preface of the study, Gen. Raymond Odeirno (Ret.) called the Iraq War “a war that the United States was well on its way to losing.” That is a sad admission about a war that cost more than 4,500 American lives and more than $5.6 trillion. Still, for those familiar with the writings of the Trumpet, the outcome shouldn’t come as a surprise. Since the beginning of the Iraq War in 2003, the Trumpet repeatedly forecast that it would not end well for America. Despite an overwhelming show of force at the start of the war, editor in chief Gerald Flurry forecast that America would fail to win in the end. [T]hough the current U.S. administration is vowing not to allow an Iranian-style theocracy to gain hold in Iraq, there are also signs in the way it is rebuilding the country that show a fundamental lack of political will to see this pledge through. Perhaps it will not be during the term of the current president, but the Bible shows that America will fail to contain Iran the way it hopes to. That bold prediction was made more than 15 years ago. And today we see that is exactly what happened! Mr. Flurry could make such a prediction because of two reasons: Bible prophecy and a basic understanding of history. [D]ecisive action in Iraq, without dealing with Iran, will not stop the terrorism. … The only way to win such a war is to deal with the main source of the terrorism, or cut off the head of the terrorist snake. But neither the U.S. nor Israel has the will to tackle Iran—even though it is the key part of the “axis of evil” in the Middle East. In terms of geostrategic consequences, the war produced profound consequences. At the time of this project’s completion in 2018, an emboldened and expansionist Iran appears to be the only victor. That’s a tragic admission. But from the beginning, the Trumpet forecast that Iran would be the victor! Read the entire article from the June 2003 Trumpet and see what Mr. Flurry wrote about Iraq falling to Iran. What a horrific outcome for a war in which the U.S. invested so much money, blood and time, and yet it happened exactly as the Trumpet forecast. That’s because the Trumpet’s forecasts are based on Bible prophecy—and time and again, world events are proving prophecy true. Iraq, the traditional regional counterbalance for Iran, is at best emasculated, and at worst has key elements of its government acting as proxies for Iranian interests. With Iraq no longer a threat, Iran’s destabilizing influence has quickly spread to Yemen, Bahrain and Syria, as well as other locations. As the conflict expanded beyond its original boundaries, the colonial creation that was the Iraqi-Syrian border was effectively erased. Bashar Assad, having misjudged his ability to control the Salafist foreign fighters that he gave safe haven for the better part of a decade, found himself threatened by the very forces that he had exploited to avert an American invasion—an invasion that in actuality was never forthcoming. Syria was plunged into a vicious civil war that devolved into a brutality only seen in the worst conflicts of the 20th century, resulting in a death toll that has topped half a million, repeated use of chemical weapons, and the worst refugee crisis since World War ii. Kurdistan evolved from a proto-state into a de facto nation, a development that has created deep tensions with Turkey. The danger of a Sunni-Shia regional conflict, with potentially globally destabilizing effects, is now greater than at any time since the original schism. Not only did the Iraq War empower Iran, these authors state that it led to the ongoing civil wars in Syria and Yemen, the potential conflict brewing between Turkey and the Kurds, and the mounting tensions between the two main sects of the Muslim world. What a disaster! As the study said, these are profound consequences, but for greater reasons than even they realize. All these events are themselves prophetically significant. Bible prophecy shows that in this end time, the Islamic world will be divided, with Iran leading a radical camp against a moderate Islamic camp allied with Germany, which leads a European power. And it is all leading to even more war! If you’d like to learn more, request and study our free booklet The King of the South, by Gerald Flurry. The Iraq War is just one in a long string of lost conflicts fought by the U.S. since World War ii. One of the reasons for losing the war, the authors point out, is because they failed to learn the lessons of the Vietnam War. Why did America lose the Vietnam War? Or the Korean War before that? Or the dozens of smaller wars fought over the last 70 years? Fifty years ago we had less power, but we had pride in our power. … But we as nations have turned from the God who so richly blessed us. And He is now withdrawing the blessings. The United States has now won its last war! We were defeated humiliatingly in South Vietnam by little North Vietnam. We have the power, but we are afraid to use it! Throughout the war, the commands in Iraq had too few troops to accomplish their military missions. As a matter of policy, [Department of Defense] leaders and strategic-level commanders enforced a de facto cap on U.S. troop strength in the Iraq theater and effectively discouraged lower-level commanders from requesting more troops. … The consequence of the troop cap was that at no point during the war, even during the surge period, did the in-country commanders meet their troop-to-task ratios or have enough troops to defeat both the Sunni insurgency (including [al Qaeda in Iraq]) and the Iranian regime-backed Shia militants simultaneously. … The problem was further exacerbated by a reluctance to increase the size of the Army and Marine Corps because of concerns that such an expansion would come at the cost of procurement and research and development. From the start, America was afraid to commit the full might of its military to the conflict. Once again, the study proves what the Trumpet has been saying for decades. Even the fact that the study was released on January 17 bears some consideration. Mr. Flurry has just completed a new booklet titled January 16: God’s Miracle Day. On Jan. 16, 1986, Herbert W. Armstrong died. Since then, we have seen significant events happen on and around the anniversary of this date. (Request this new booklet to understand the significance of that date.) For the study to be released around that January 16 date is itself a validation of sorts of the fact that Mr. Armstrong warned of the outcome of the Iraq War decades before it was even fought! The study proves again that he was right! Each day the Trumpet continues to forecast what is soon to happen in the world. That forecast is based on the more sure word of Bible prophecy. Many scoff at the idea of Bible prophecy, but that in itself is a fulfillment of Bible prophecy (2 Peter 3:3-4). God reveals through hundreds of prophecies written over thousands of years what will happen in the end time, the time we are living in right now. Many of these prophecies foretell a world cataclysm resulting in the near destruction of all humanity. Jesus Christ Himself prophesied this in Matthew 24:21-22. But Christ also said He would return to stop man from destroying himself. That is the good news the Trumpet forecasts. While there is a lot of violence and destruction ahead, it all leads to the greatest news of all time: the return of Jesus Christ to establish the Kingdom of God on Earth! That too is prophesied! He will usher in a time of peace and prosperity this world has never before experienced. To learn more about that time of great hope and abundance, request a free copy of Mr. Armstrong’s booklet The Wonderful World Tomorrow—What It Will Be Like.